Bernward Koch is a well-respected German New Age/Ambient Artist. With eight albums to his credit, Silent Star shows off Koch’s talent with keyboards, synthesizer and programming. These compositions are inspired by Otto Lilienthal, an inventor and “father of flight” that Koch has always admired. The tunes are light, almost shimmering in their appeal, with the piano melodies adding that special Koch magic that makes his works appealing. This CD has some very catchy melodies that stand out in the fourteen tracks that comprise this album. I really enjoyed the track She; it was gentle and very relaxed. Silent Star was reminiscent of classical piano pieces played in the great halls of old but gave a feeling of drifting and floating through an ambient sky. The Color of Spring was a bouncy and delightful composition that brings to mind daffodils and young children running in fields of spring flowers. This is an enjoyable work that will leave you feeling spirited and playful. The piano is never overpowered by the accompanying synth. Rather, it adds to the work, providing harmony and balance. While I love pure piano, this CD shows how electronic work can fill in and bring to the front exceptional piano work, especially from a very talented composer and pianist. 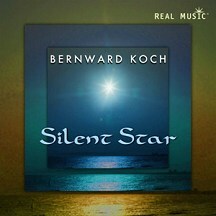 Bernward Koch is one of our best contemporary New Age musicians, and this CD will add to your library of relaxing and pleasurable ambient collections. And if you love New Age piano, this CD was made for you. If you haven’t tried Bernward Koch, this is a great introduction to the man and his work. Mixing melodies with nature sounds is a common practice amongst New Age musicians these days. But it’s not the mix that is important; it’s the quality of the music that makes the mix work. Kenio Fuke is a Brazilian pianist and this is his debut album with Real Music. It is not disappointing. Rather, the quality of the piano work to achieve a relaxing yet interesting mood is top shelf. The piano compositions are contemplative but never unduly so; light but not unimaginative. I found the titles appropriate for the tracks, eliciting a visual to accompany the melodies. Garden of Roses gave me the impression of a stroll through a regal Victorian rose garden. Spirit of the Water took my imagination to waves and beaches. Enchanted Forest was the dense cover and peaceful retreat of an early morning walk in the forest. Sounds of water and birds accompany the compositions, lending an air of nature without being overdone. They are skillfully dabbed through the tracks to create an atmosphere, not a jungle or a flood that overwhelms the senses. I did find this to be a preferred early morning collection. The music is soft, gentle and great with coffee and watching the sunrise. But it will enhance any space where peace, relaxation and calm are called for. 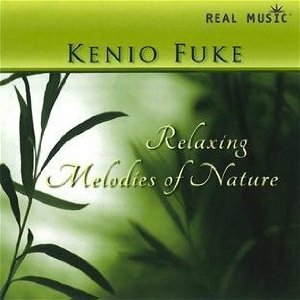 This is a very serene and comfortable collection of piano that is skillfully crafted by Kenio Fuke. Relaxing Melodies of Nature is a good addition to your ambient collection. Rasull Soon, who performs as BlueMonk, presents us with striking and haunting melodies in his debut CD. 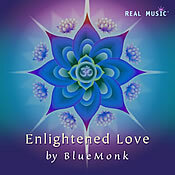 BlueMonk delights us with his soft and seductive piano and on certain tracks combines with the wonderful talent of flautist Rajendra Teredesai, whose compositions compliment Blue Monk’s piano. Mr. Teredesai is a well-known and respected Indian flautist, who provides us with some incredibly beautiful Indian bansuri or Native American flues. The constant theme is soft, relaxing and mood setting background music to enhance your space. Real Music, the label, has always presented artists whose ethereal music will set the mood for complete calm and relaxation. This CD is no exception. And their choice of piano and flute here is an outstanding example of the kind of material I have come to expect from Real Music. 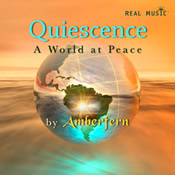 There is a very eastern flavor to many of the pieces and there are some very Native American sounding tracks as well, but the music can still be considered “world music.” The piano and flute are combined with electronic enhancements to lend a very otherworldly feel to the music sometimes, while offering some harmonic accompaniment to the composition. As a Reiki practitioner, I am always looking for music to compliment my practice. This collection of peaceful and contemplative compositions gives the exact air to the practice room and settles well with my clients. This is a perfect CD for my practice and will be added to my playlist. Stand out tracks on the CD are Alicia’s Dream, that features the flute work of Mr. Teredesai accompanied by Mr. Soon’s piano. The music is very ethereal, very peaceful and an excellent composition. Ancient Wisdom has a Native American feel. The flute work of Mr. Teredesai is exceptional. A beautiful track where east crosses to west with grace and dignity. My favorite pick is the track Eastern Sun. This is an Oriental work, with chirping birds and flowing water, first-rate eastern flute work and electronica that sets a relaxed and stress-free mood. I love how a range of oriental instruments are created and Mr. Soon’s piano work compliments the entire presentation. For music to set a peaceful mood at the end of the day, or to compliment your environment anytime, this album is a good choice. I recommend it to alternative therapy practitioners to enhance their working space. I find soft guitar work to be both soothing and calming. Mike Howe presents us with 17 tracks of excellent, smooth guitar compositions that will enhance your workspace and your home. This English born musician was nominated for best new artist for his debut album Time Stands Still back in 2009, as well as Best Instrumental Acoustic album for his second release. This CD continues in the same vein of exceptional guitar. This is classic acoustic guitar work; melodic, harmonized and offered up ,simply, for the listener’s enjoyment. The music stands on its own with very little accompaniment. Mr. Howe does play all the bass, keyboards and percussion that accompany some of the work. There is variety in the tempo which makes sure that the CD never becomes boring. Sometimes contemplative, sometimes upbeat, the variations are easy on the ears and never intruding. Mr. Howe’s guitar work is quite polished; he has a style that is uniquely his own, which lends an emotional feel to the compositions. My picks from this CD are Top of the World; an almost James Tayloresque sounding piece, but much more developed for acoustic guitar, it’s bright, cheery and warm. Summer’s Here has a very jazzy feel to it, smooth and gliding. I am reminded of some old Motown releases with brass and featuring guitar. My favorite has to be the opening track, Beyond the Mountains. I love the guitar work here, simple but melodious. The chord harmonies are outstanding and the piece is very contemplative. 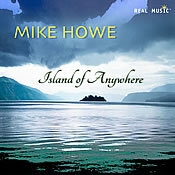 Mike Howe's guitar work on Island of Anywhere is an enjoyable journey in a picking style that is both tranquil and pleasing. The listener is able to submerge themselves in this soothing environment letting the ebb and flow of the guitar act as a rudder to guide them through the undercurrents that he has skillfully woven into his music. Mike is a highly talented individual but the listener is not subjected to pyrotechnic displays of his guitar playing prowess just to show he can do it but rather the guitar playing is subtle so as to focus the music on the mood that is being created rather than on the player himself. Island of Anywhere is an exceptional album which presents Mike Howe in all of his brilliance creating music that is filled with passion and that will tug on the strings of your heart resonating with your spirit. Clive Brooks, also known as Amberfern, produces meditative and healing new age music. He lives in England’s New Forest National Park, and you can hear the natural influences in his music that have no doubt been absorbed from his surroundings. This CD can be categorized as World Music as you can hear the influences from a variety of world cultures in his compositions. Clive uses drums, vibes, synths and more to create a sound palette that interweaves music that at heart contains elements of ambient, new age and electronica. Clive has skillfully woven these various textures together to create an introspective sound stage that takes the listener on a sonic adventure through these different realms. It is peaceful, mood setting and sometimes intentionally brooding. These are wonderful compositions with which to create a quiet and thoughtful setting that will allow the listener to relax and unwind. My preferred songs off this CD are Light on Water, a somber piece, which tantalizes the listener with a slight oriental flavor. This song can be very intense but it is essentially contemplative in nature. Bedouin Sunrise captures the Middle Eastern feel extremely well. This is a melodic and very fascinating composition. Seagulls, a jazzy beat and an almost West Coast feel comes across in Clear Skies. I love the vibes and flute combination. But my favorite is the opening track on this album called Misty Harbor. Water, ethereal “fog” and an electronic keyboard blend in a very appropriately titled song. This is an impressive CD that presents the work of Amberfern aka Clive Brooks who is a very talented musician and does not disappoint. The overall feeling of the album is very ambient, very electronica, and quite wonderful to listen to.